The global warming results in increased endosymbiotic archaeal growth. The archaeal magnetite and porphyrions can produce increased quantal perception and neanderthalisation of the human brain. 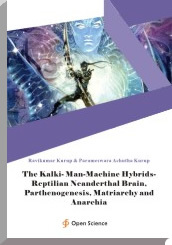 The neanderthalisation of the species results in development of man-machine hybrids or the kalki. Studies have shown low level of EMF pollution leading to increased archaeal growth. The netocrats and netizens are exposed to continuous low level of EMF pollution. The archaea contains magnetite and can catabolise cholesterol to generate porphyrins. Archaeal digoxin can produce sodium potassium ATPase inhibition and a pumped phonon system acting through dipolar magnetite and porphyrins to generate a Frohlich model of Bose-Einstein condensate and quantal perception. The archaeal magnetite and porphyrins can produce increased perception of low level of EMF leading onto prefrontal cortex atrophy and cerebellar hypertrophy. This can lead onto neanderthalisation of the brain and a robotic human personality. The brain quantal fields can modulate the low level EMF fields in the internet and the interaction can alter internet function and the quantal fields of other brain operating the internet. The interactive quantal fields of the human brain and the low level EMF quantal fields of the internet form one single whole functioning as a universal collective unconscious.